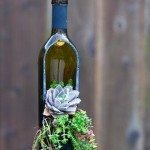 Turn wine bottles into gorgeous succulent planters! | DIY projects for everyone! Home Home Decoration Turn wine bottles into gorgeous succulent planters! Turn wine bottles into gorgeous succulent planters! Cutting bottles can be difficult at first. If this is your first time doing a project with glass bottles, you can go with the simplest method of dividing the bottle horizontally as shown in our main image above. Glass bottle planters cut like this can only accommodate one larger succulent at a time. If you have some experience in glass bottle cutting, then you can cut the bottle vertically so that your bottle planter is lying down with more surface area for more succulents! Whichever way you choose to cut your wine bottles, it’s always best to use real glass cutters for a cleaner cut. Don’t forget to sand down the edges, too, to avoid injury from your DIY planter. These wine bottle planters are perfect living decorations at the dining table, coffee table or kitchen counters. They are also great gift ideas for friends and family!